I have already short stroked the gear and piston, two teeth on the gear and two on the piston, as well as swiss cheesed. My idea is that i need a stronger spring, but i have a site limit on 350fps on .20g bbs. PS. if anyone know where i can get my hands on a btc spectre, throw some information my way! Are you running an active MOSFET? I'm running the mosfet ive linked below. Im not 100% sure which one it is but i THINK it is this one: http://www.gatee.eu/products/aeg-mosfets/nanoaab But again im not sure. 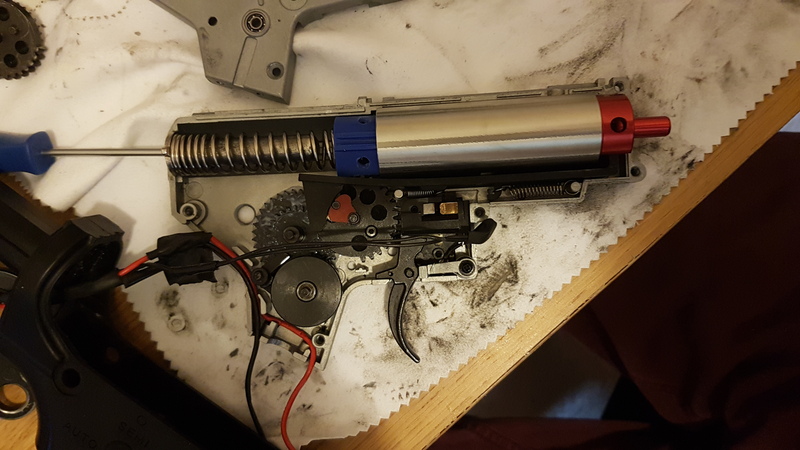 The gun is preowned and the mosfet is one of the things that was already installed. Anything you could recommend? I was thinking of hunting a Spectre to be honest. I have both a 11.1v lipo and a 7.4v lipo, where i usually use the 7.4 out of the two. Also the wiring is going to get replaced as soon as possible thats for sure, the guy that had the gun before me had it screwd up. The gun is ment for semi auto only, i forgot to mention that, so im not after the RPS at all. Its more for trigger response. Your SHS piston is not going to last you yonks if going 30+. That plastic is very light - very very light like 10gms or so on its own but the plastic teeth strip very easily when pushed. Is that what you mean by overspin, if so it is AR not fitted properly.